A Master Pastelist, Aline fills her time with teaching, traveling, juried shows and exhibitions. Her work in oil and pastel is represented in three New England galleries and the Chasen Galleries of Richmond VA and Charlotte NC. 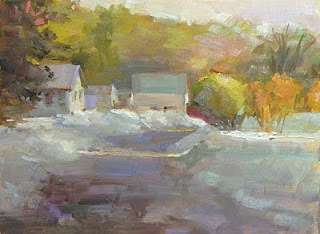 Of this wintry oil she says, "The houses of New England remain beautiful in any season. An early snow allowed for some autumn colors against all the hues of white".